» Show Your Sense of Duty with Popeye! Popeye > News > Uncategorized > Show Your Sense of Duty with Popeye! Our favorite sailor and Card.com have teamed up to raise funds for the brave military servicemen and servicewomen who have been injured in the line of duty. 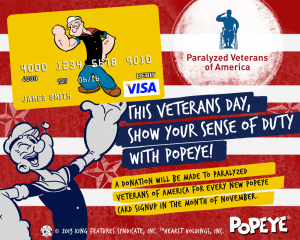 This Veterans Day, and throughout November, $5 will be donated to Paralyzed Veterans of America for every Popeye card that is loaded with $50 or more by the last day of November.